Wednesday August 13th 1890 Mother went out to Otts early this morning. I sent Will to bring Mary over to spend the day with me. We had a good visit. I made curtains for up stairs. Mother and Miss Lewis came home this evening. 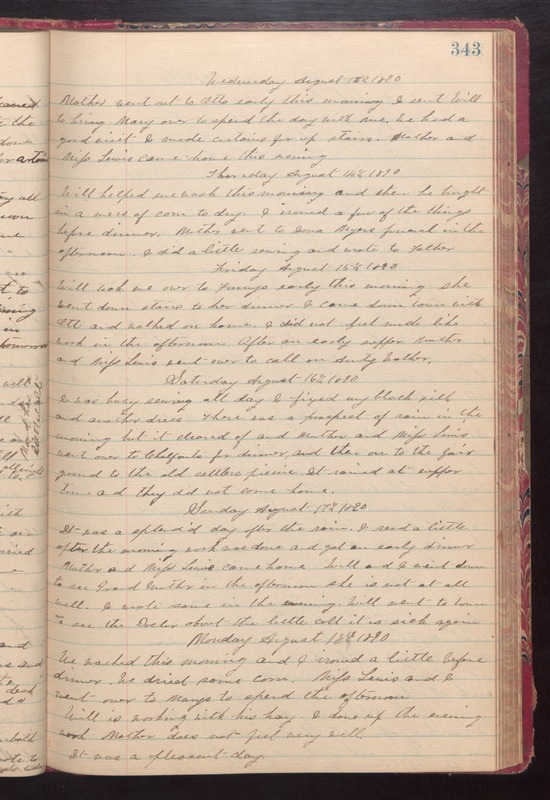 Thursday August 14th 1890 Will helped me wash this morning and then he brought in a mess of corn to dry. I ironed a few of the things before dinner. Mother went to Iona Myers funeral in the afternoon. I did a little sewing and wrote to Father. Friday August 15th 1890 Will took me over to Fannys early this morning. she went down stairs to her dinner. I came down town with Ott and walked on home. I did not feel much like work in the afternoon. After an early supper Mother and Miss Lewis went over to call on Aunty Walker. Saturday August 16th 1890 I was busy sewing all day. I fixed my black silk and another dress. There was a prospect of rain in the morning but it cleared of and Mother and Miss Lewis went over to Chalfants for dinner and then on to the fair ground to the old settlers pcinic. It rained at supper time and then did not come home. Sunday August 17th 1890 It was a splendid day after the rain. I read a little after the morning work was done and got an early dinner. Mother and Miss Lewis came home. Will and I went down to see Grand Mother in the afternoon. she is not at all well. I wrote some in the evening. Will went to town to see the Doctor about the little colt it is sick again. Monday August 18th 1890 We washed this morning and I ironed a little before dinner. We dried some corn. Miss Lewis and I went over to Marys to spend the afternoon. Will is working with his hay. I done up the evening work Mother does not feel very well. It was a pleasant day.